Unseaworthy dinghies, swinging in rough seas, having to withstand the weight of men, women, and children. Hundreds of thousands of people, marching together towards Hungary’s barbed-wire fences. European diplomats, desperately looking for a way to manage the chaos. Soldiers at the borders, crammed reception centres, shoes washed up on shores. As images and videos that reach us from TV sets and computer screens emphasize a crisis narrative, this is the way we picture migration today. Uncontrolled, unmanageable, unsustainable. But is this the truth? In other words, is this a good representation of reality, today or in the recent past? Hello, and welcome to the first post of “Continental Drift”. My name is Matteo Villa, I am a research fellow here at the Italian Institute for International Political Studies (ISPI), and I will be your host for as long as you’ll decide to stick around. With this blog, my ambition is to offer you timely, data-driven insights on all things migration. I aim to give you a broader perspective on the issues of the day, scratching below the surface and looking at the picture from as many angles as possible. I will mainly focus on what happens in Europe and its neighbourhood, especially the Mediterranean, but will not be afraid to venture into other regions of the globe, whenever needed. Okay, so: “Continental Drift”. Why the name? You should all be familiar with the origins of the term. This immediately feels like the perfect metaphor for what happened in migration policies and politics over the past few years. European governments have been drifting apart, breaking promises they made to each other and ditching solidarity in favour of isolationism. Whenever they act as one, EU member states choose policies that deter migration, drifting away from countries on the southern and eastern shores of the Mediterranean. And migrants themselves, whether in Libyan detention centres or in overcrowded camps in Lesvos, are increasingly left without hope: drifting along. 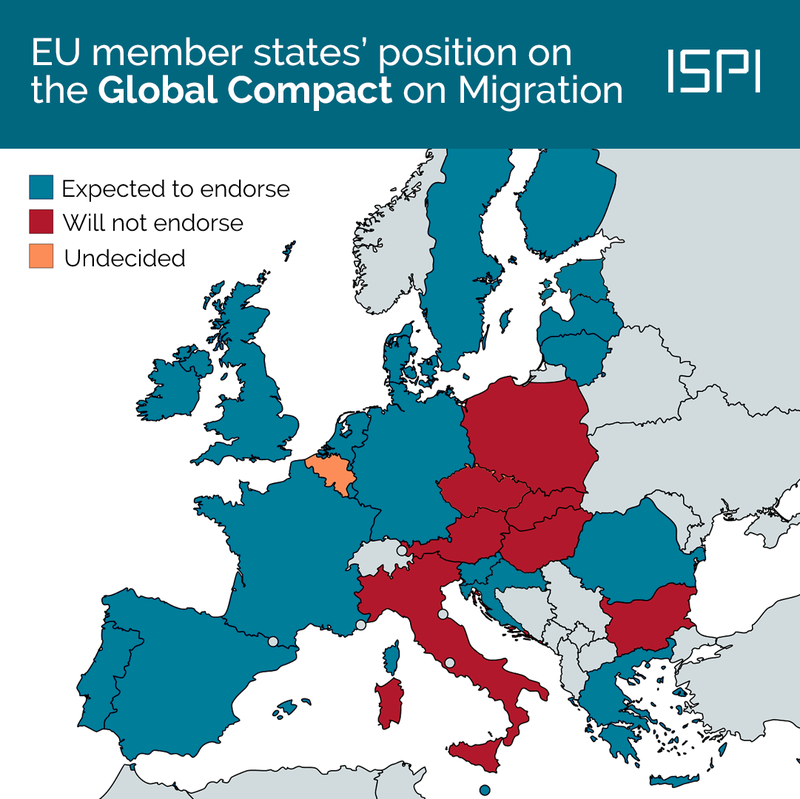 All this considered, what best way to start this blog than to show you how Europe is drifting apart on one of the most important initiatives on migration in the past two years: the Global Compact for Safe, Regular and Orderly Migration (or GCM, for short). The GCM is the result of a two-year negotiation process, starting in late 2016 after the UN General Assembly adopted the New York Declaration for Refugees and Migrants. The New York declaration kicked off work to get to a Global Compact on Refugees (GCR) as well, and the final drafts of both the GCR and the GCM were published a few months back, ready to be endorsed by UN member countries by the end of 2018. After Donald Trump’s inauguration in January 2017, the United States was the only UN country to drop out from the process, not even participating in the negotiation of the two documents. But all other countries stuck to it. Almost until the end. In recent months, however, a disinformation campaign in many countries has caught on. Increasingly vocal activists and politicians claim that the GCM will “legalise an invasion” of migrants. This is false: the GCM is a non-binding document, setting out general principles and best practices, but introducing no additional obligations upon countries. In its preamble, the GCM itself states that the Compact “presents a non-legally binding, cooperative framework” that “upholds the sovereignty of States”. Overall, the GCM is a symbol of cooperation on one of the thorniest international issues, but not much more than that. Despite this reality, a growing number of countries has signalled that it is not willing to endorse the document at an intergovernmental conference that will take place in Marrakesh in just a few weeks’ time, on 10-11 December. As of today, ten countries are expected not to endorse the GCM in Marrakesh (another one, Switzerland, will not endorse the GCM at Marrakesh but should do it at a later stage). Strikingly, seven of these countries are EU member states, with at least another EU country still having to take a decision, one way or another (see map above). For now, the EU countries that have decided not to endorse the GCM are a remarkably similar group to those who, between 2015 and 2017, opposed an EU emergency mechanism to relocate asylum seekers from Italy and Greece to other member states. But hostility to the GCM is starting to affect Western Europe as well: almost no EU country (including Germany and France) has been left untouched by the debate, Belgium is currently on the fence on whether to endorse the GCM or not, and Italy has just decided today not to attend the Marrakesh conference. We will see how this plays out between today and the next two weeks leading up to the Marrakesh conference. For now, one thing is clear: on migration policy, the European continental drift is here to stay.